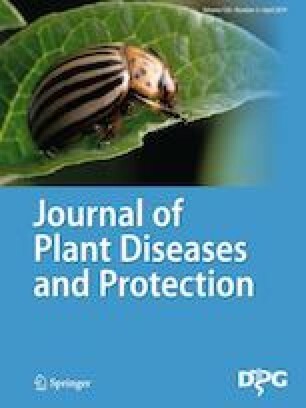 Does QoI (strobilurin) resistance in isolates of Puccinia horiana, the causal agent of chrysanthemum white rust, occur in western Japan? Three isolates of chrysanthemum white rust fungus, Puccinia horiana, were collected from two regions in Hiroshima Prefecture, Japan, in 2017. In an in vitro spore germination assay, these isolates showed normal sensitivity to azoxystrobin. In inoculation tests, however, curative spraying of azoxystrobin at the recommended concentration was ineffective at suppressing symptoms caused by two isolates, although preventive spraying suppressed the disease sufficiently. The isolates did not carry the F129L mutation related to resistance to quinone outside inhibitor fungicide in their cytochrome b gene. These results suggest that the sensitivities of P. horiana isolates in Hiroshima to curative application of azoxystrobin may be reduced by mechanisms other than target-site modification. The author thanks Dr. Hideo Ishii of Kibi International University for advice.